The three suspects arrested by CCPD. The three suspects related to the Aug. 7 police shooting in Camden are now in custody, according to the Camden County Police Department. 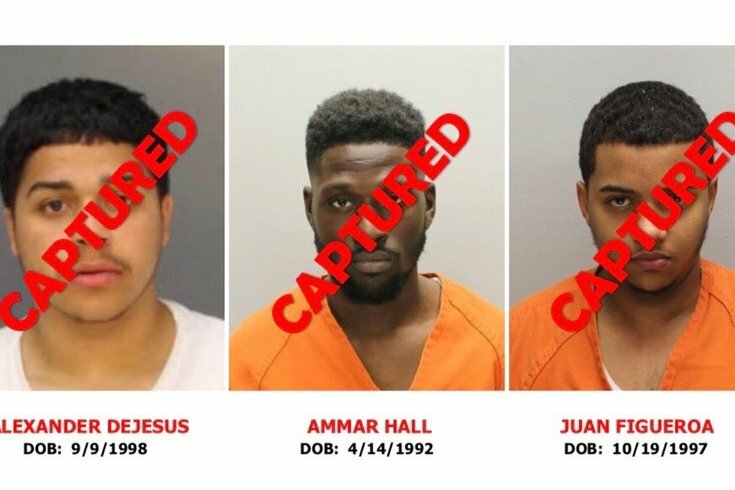 Alexander DeJesus and Ammar Hall were arrested in Kensington late Tuesday afternoon, police said, three days after Juan Figueroa was apprehended. On Aug. 7, two male suspects started shooting at the plainclothes detectives in their unmarked vehicle about 8:30 p.m. at Broadway and Walnut streets in downtown Camden, authorities said earlier this month. One of the detectives returned fire. Camden County Police Chief J. Scott Thomson told reporters between 10 and 25 rounds were fired at the detectives. The detectives, who were not identified by authorities, were taken to Cooper University Hospital for treatment of their wounds. They have been placed on administrative leave pending the investigation. The reward for information regarding the suspects was upped to $60,000 just 10 days ago.